1. 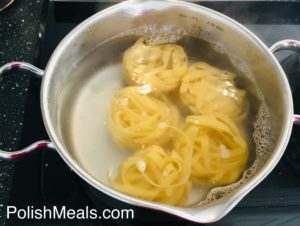 Bring water to boil for pasta, and cook al dente according to directions. 2. 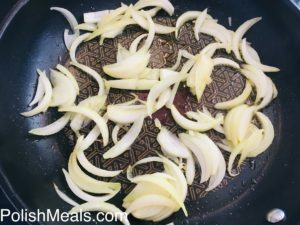 While water for pasta is heating up/then pasta cooking, heat up oil with onions in the wok. 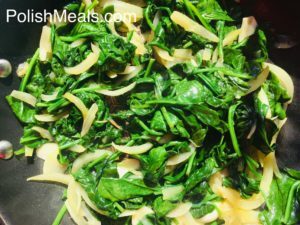 Medium heat, stirring, simmer for 5 min or until onion is quite soft. 3. 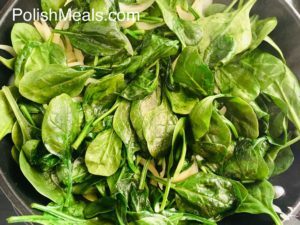 Add spinach and cook on medium heat fir another 5 min or until spinach shrinks. 4. Add garlic, fry for another 1 min. 5. Add cream, spoon of salt, blue cheese and bring to boil stirring all the time to avoid burning. It should start bubbling. 6. Add pasta (should be ready by now, still hot) using pasta utensil from the pot to the wok. Do not drain or rinse the pasta. 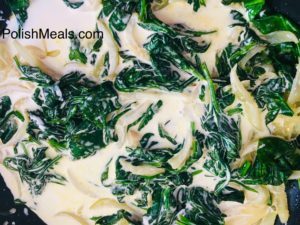 Mix with creamy sauce while on medium heat. Cook for another 3-5 minutes until bubbly. 7. Serve on soup plate or in a bowl. Season with pepper, spoon pf olive oil and 4 tbsp parmesan cheese per portion. 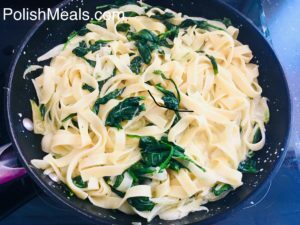 Posted in: Main Courses, Meal Ideas. 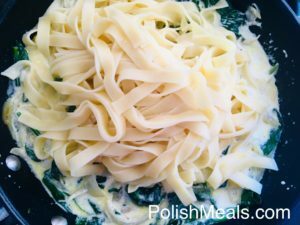 Tags: blue cheese, cheese, cream, creamy, garlic, italian, lunch, oil, olive, onion, parmesan cheese, pasta, polish, spinach, tagliatelle.